Where does CSS class name come from? Other cases: Which template styles can produce named rules? How to substitute generated CSS rules with custom ones? Specify whether to generate the external CSS file (global style sheet). When this option is unselected (false), no external style sheet file will be generated. In that case, all CSS rules used in the generated HTML will be defined locally within those HTML files themselves, inside <style> element. Specify a CSS pattern file to frame the generated global style sheet into your own CSS file. 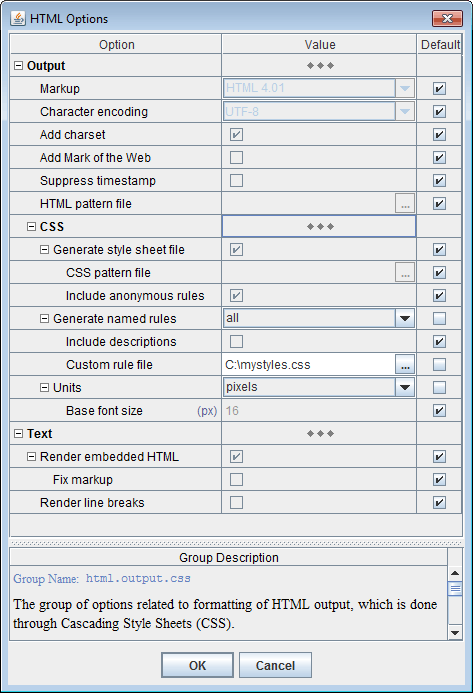 Specify whether all generated anonymous CSS rules must be stored in the external CSS file (global style sheet). Anonymous CSS rules are CSS rules generated from the formatting settings specified on template components. They are called “anonymous” because these are basically sets of inline CSS properties initially generated for particular HTML tags and, then, moved to a style sheet to eliminate their repeating across the HTML file(s). Now, only class selectors assigned to those CSS rules are specified in the HTML tags (instead of the original CSS properties). But the class selectors are generated automatically, which depends on how early a particular CSS property set was registered in the style sheet. That makes them completely unpredictable and dependent on the data being documented, which prohibits substituting the anonymous rules with any custom ones. When this option is selected (true), all anonymous rules generated across all generated HTML files will be collected in the global style sheet (which is printed further as the external CSS file). That produces the most compact documentation files, since many anonymous rules repeat themselves across different HTML document. So, it is the default setting. Since anonymous CSS rules (i.e. their class selectors) are generated completely unpredictably, even a little change in the input data, which would affect just a single HTML file, may cause a great disturbance in the naming of all anonymous rules stored in the style sheet used by that HTML file. When it is the global style sheet, all HTML files, where any anonymous rules are used, will change too. This won't be good, for instance, when you store your generated documentation in a repository system that updates only changes of files relative to the previous version. Then, a massive disturbance in the generated HTML (caused by just a few changes in the input data) will lead to a massive update of your repository (particularly in the case of very large documentation). So, keeping all anonymous rules locally would help! If you substitute all generated default and named CSS rules with your custom CSS rules and exclude all anonymous rules from the global style sheet, its content effectively becomes static. Then, you can simply use a CSS pattern file as a complete your CSS file. Specify whether to generate named CSS rules. Named CSS rules are CSS rules generated from the formatting styles defined in templates. When such a style is assigned to a template component, the HTML tags generated by that component can be assigned with the CSS rule generated from that style. The class selector assigned to that CSS rule is specified in the template style itself (or derived from its name). Therefore, it has a constant (predictable) relationship with both the particular CSS property set produced from that style and the particular output structures where that CSS rule is applied. This opens a possibility to substitute the generated named CSS rules with the custom ones. Please note that named CSS rules are not required for proper HTML output and will only increase its size. You need named rules only when you want to style the generated HTML documentation with your own CSS properties/rules. Disable the generation of named CSS rules. Generate all named CSS rules possible. When this setting is selected, almost all template formatting styles involved in the generation of the particular HTML output will be rendered into named CSS rules. See also: Which template styles can produce named rules? Generate only those named CSS rules, which come from the template formatting styles with the selected "CSS | Allow named rule" property. Specify whether to add the descriptions of template formatting styles to the named CSS rules generated from them. * of each generated document. Such descriptions may help you to understand the purpose of particular named CSS rules and to decide whether and how to substitute them. When this options is unselected (false), no descriptions will be added. Specify a (CSS) file with custom definitions for some of the automatically generated default and named CSS rules. For more details, please see: How to substitute generated CSS rules with custom ones? Specify measurement units used in the generated HTML. This applies to font sizes and most of length values (like spacing, margins, paddings etc. ), which are specified as properties of CSS rules generated directly from the formatting properties of template components and template formatting styles. Note: A few length values are always specified in pixels (e.g. border width), because otherwise their effect would be highly unpredictable. This is the default setting. All font sizes are specified in percents relatively to the document base font size (determined by the HTML browser). Other things like spacings, margins, paddings etc. are set in em units, which are also interpreted against the base font size. 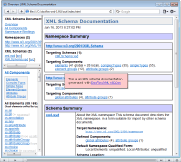 Relative units are considered most convenient for viewing HTML documentation in web-browsers. However, there is one problem. According to CSS, the effective value of a CSS property specified in relative units is actually computed against the font size inherited from the parent element where the property is applied. This creates the problem of compounding, which requires special efforts to work around. For more details, see Appendix | The problem with relative length units. All font sizes, spacings, margins, paddings etc. will be set in pixels (px). All font sizes, spacings, margins, paddings etc. will be set in points (pt). This is actually not a single but two different options corresponding pixel and point units. For relative units this option is not available. Specify the base font size in case of pixel units. The default value is 16 (px). Specify the base font size in case of point units. The default value is 12 (pt). All informative content of HTML files (i.e. 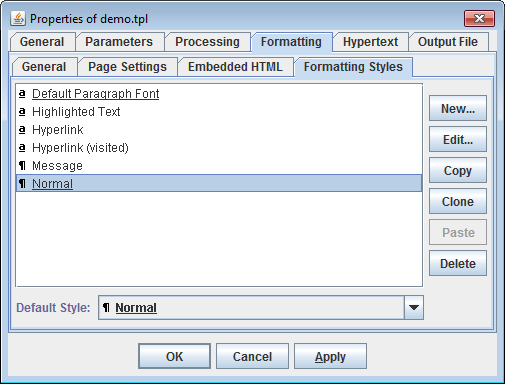 HTML tags and text) is generated by various template components through their interpretation. When a template component is interpreted, it produces a piece of HTML output (which is typically represented by a certain HTML element). All formatting of that output comes in the form of CSS rules. The rules themselves are placed in the style sheet and the class selectors associated with them are specified in HTML tags. Those categories determine how the rules are produced, applied and what you can do about them (see Custom CSS Rules / CSS File). When a template component is interpreted, every formatting property specified on it is rendered with a certain CSS property. So, a list of CSS properties is created. That would produce a valid HTML with all formatting in place. The rule's class name is used here only for linking purpose. So, it is generated automatically just to be unique in the given style sheet (and as short as possible). Such CSS rules, which are produced by the generator automatically in order to replace with them the inline CSS properties, we shall call anonymous rules. That's because the class names assigned to those CSS rules, besides being meaningless, have no constant relation with the particular lists of CSS properties they represent. Exactly how such class names are generated depends on the data being processed. Another HTML document generated by the same template may contain similar anonymous CSS rules, but associated with different class names. Even when a global style sheet is maintained, the rule class names may be different when you generate another documentation for a different data source. That prohibits using any custom CSS rules to replace the anonymous ones. If you need to change something in the formatting of the generated HTML, you have to edit the corresponding templates and rely only on the formatting capabilities provided by FlexDoc (via the template language and its rendering by the HTML generator). That problem has been solved with the introduction of named CSS rules. Since FlexDoc/XML 1.9 (FlexDoc/Javadoc 1.7), it is possible to associate with particular CSS rules some constant (and meaningful) class names. That is, whenever some HTML documentation is generated by a given template set, a particular CSS rule (i.e. a specific set of CSS properties) used across all generated HTML files will be always associated with the same CSS class name. Such CSS rules associated with constant class names that are specified in templates, we shall call named rules. By that name the style can be assigned to any component in the template. When a component has a formatting style, those formatting properties not specified directly on the component are inherited from the style. 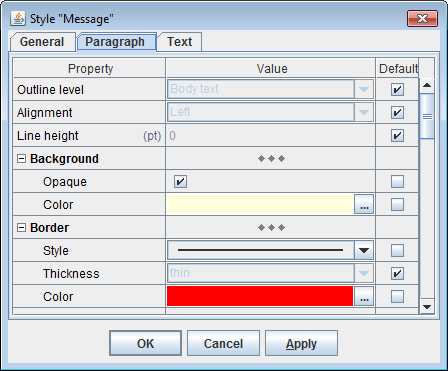 Originally, template formatting styles were modeled on RTF styles. 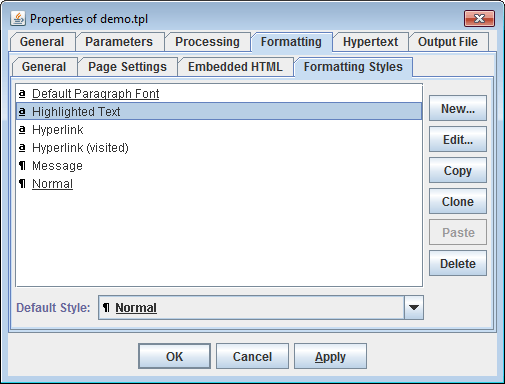 When RTF output is generated, a template formatting style would be rendered with a corresponding RTF style. When a template formatting style has no specified "CSS | Class name" property, the valid class selector will be generated automatically from the style name. Any template formatting style has a certain (primary) name, by which it is identified in the template. That name may be a rather long string with spaces, which is unsuitable for immediate use as a CSS class name. But a valid CSS class name may be produced automatically from that primary name using some conversion. For example, the automatically generated CSS class name for the style shown on the screenshot will be "Highlighted-Text". As it was said early, named rules are generated from template formatting styles, which have not been modeled on CSS and do not conform to it perfectly. That means, some template styles cannot be expressed with a single CSS rule. Rather, they must be rendered with several CSS rules applied to different HTML elements nested in each other. Such multiple CSS rules (produced from the same template style) will still have the same class name (specified in the style). So, you can substitute all of them with your custom rules as well. Some formatting properties specified in templates have no direct analogues in CSS. For example, there is no special CSS property for background color of text. Of course, CSS has 'background-color' property, but when it is applied to a particular HTML element, it will color the whole object described by that element. For instance, when that is a <div>, the entire strip on the page will be colored - not just the text contained in it! 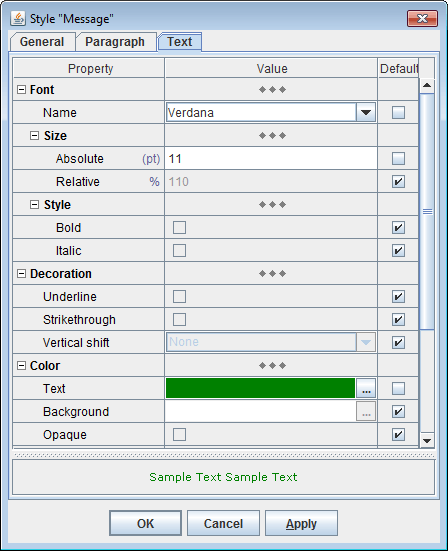 would not produce the top and bottom margins as intended in the template, because the values for those margins specified in the rule would be interpreted not against the document base font size, but against a new font size (reduced to 90%), which comes from the rule itself. Of course, the margins may be corrected according to that local font size too. But such tricks would complicate everything enormously. Some hyperlinks must not be too prominent. That is, they must look the same as the normal text, yet have something indicating the hyperlink (e.g. underlining). Another possibility is that the hyperlink must be hidden completely, so it appears as ordinary text all the time, yet reveals itself when the mouse cursor hovers over it. Both effects can be achieved by formatting the hyperlink as normal text and adding to it some extra-formatting (indicating the link either constantly or only during the mouse hovering). Formatting of a hyperlink as normal text means applying to the <a> element the same CSS properties as for the normal text and having those properties override any default hyperlink formatting. So far, we discussed a situation when all formatting properties of a template component come from a formatting style (e.g. 'Highlighted Text') assigned to it. That will produce a named CSS rule ('highlight') applied to the component's HTML output. The ordering of the rules in the style sheet is important! Since formatting properties specified directly on the template component override those defined in the template formatting style, to have the same effect in HTML, the CSS properties defined in the anonymous rule must override similar properties found in the named rule (generated from the style). This works only when the anonymous rule appears in the style sheet later (below) the named one. 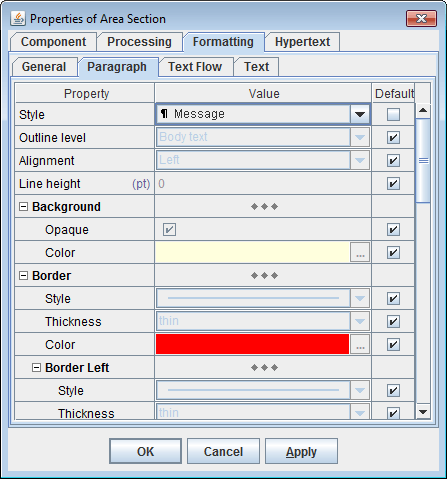 Now, let's look into even more complex situation, where, along with the formatting properties directly specified on the component, two formatting styles are involved: one for paragraphs and one for text. You can see that the word “highlighted” is formatted with three CSS rules simultaneously. That's possible according to CSS and will work fine in any modern HTML browser! 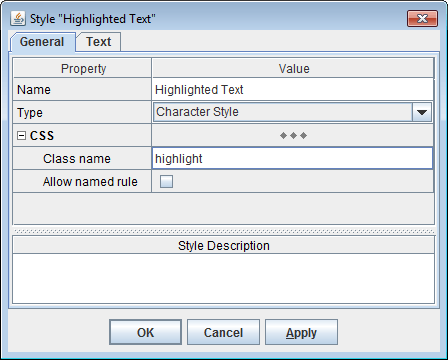 But you may notice also that both 'msg' and 'highlight' rules specify the color property. So, which color will be used for “highlighted” then? According to how CSS works, it will be the color from the latest defined CSS rule, that is from 'highlight'. That will be the same in any browser! See also: Applying multiple CSS rules to the same HTML element. In the previous section (“Named + named + anonymous rules”) we have seen how two named rules generated from a paragraph and character formatting styles were applied together (along with an anonymous rule) to format the same piece of text output. No. 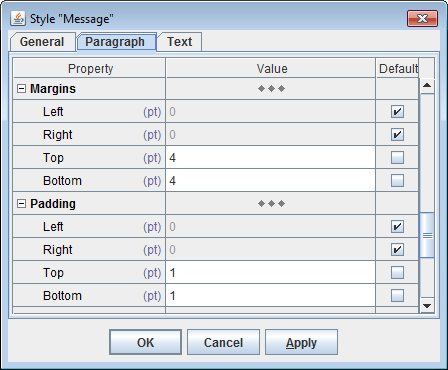 Although templates do allow assigning formatting styles to any parent/container components (or even having a style chain formed dynamically during the calls of stock-sections or subtemplates), the generator actually tracks only the nearest paragraph style and nearest character style (nearest to the component being interpreted). Only those styles may be rendered into named rules. There is one exception, however. It is hyperlink styles. 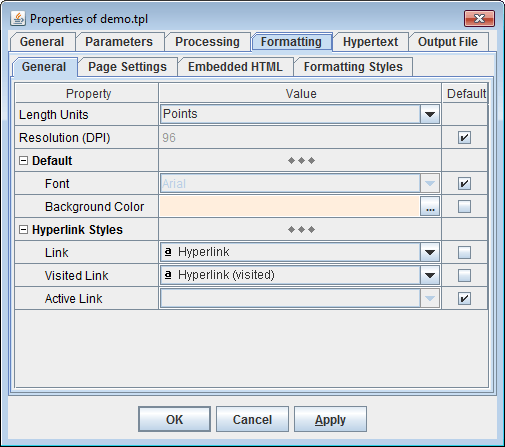 Hyperlink styles are the character formatting styles assigned to the template controls that may generate hyperlinks. When a hyperlink is generated, the hyperlink formatting style will be applied to it, including in the form of a named rule. There are several methods of how hyperlinks are formatted. One of them is blended-in hyperlink (i.e. the hyperlink always looks the same as the ordinary text at the given location, however, with some extra feature indicating the hyperlink). In that case, when a paragraph, character and hyperlink styles are involved together and all provide some text formatting properties, all of them will be rendered into the corresponding named rules for the <a> tag, so that all the three rules are applied to the hyperlink. The formatting properties originating from any other styles will be treated the same as those assigned to the component directly (that is, they will get into the anonymous rule). That means that when a certain template formatting style being involved in the generation of the output is always shadowed by other styles, it will never get visible as a named rule. That's because when even more template styles are tracked simultaneously to become named rules, the implementation of that becomes so complicated that it isn't worth it. Also, the formatting properties defined in those styles may override each other according to how the styles are ordered in the chain. Replicating the same behavior in CSS would require the equal ordering of the corresponding named rule definitions. But what if the same styles are applied somewhere else in a different order? In short, CSS simply doesn't support such things. The object model of CSS rules is too rudimentary for this. Named CSS rules are not necessary for proper HTML output and will just bloat its size. You need named rules only when you want to substitute some of the generated CSS rules with your own ones. When it is set "none", no named rules will be generated. Then, all formatting properties of a template component will be treated the same, irrelevant where they originate. That will produce only anonymous rules. When the option is set "all", all possible named rules will be generated. This allows you to enable exactly those named CSS rules, which you are going to substitute. 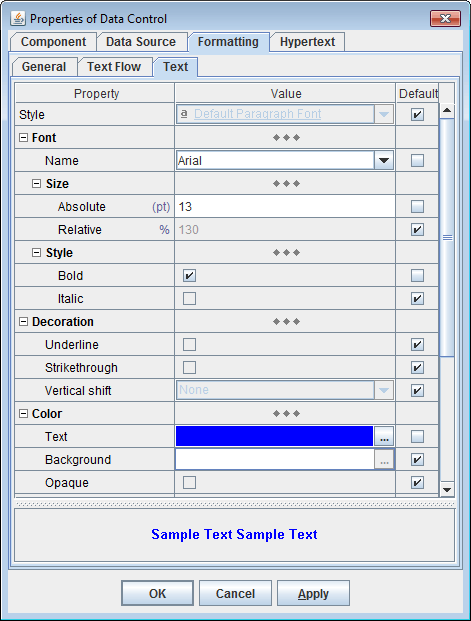 When a template component is set to generate a paragraph or a piece of text and has no particular paragraph/text formatting property (specified either directly on the component or inherited from a template formatting style assigned to it), that property will be looked for in the template default paragraph style. which is actually never generated. 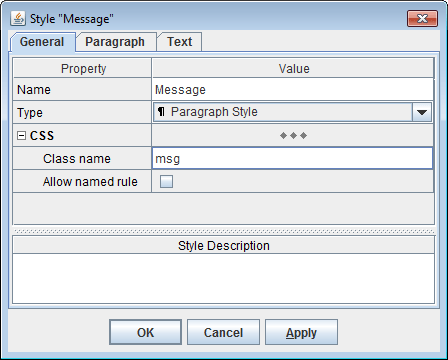 Note that a formatting styles defined in the main template will override any equally-named style found in subtemplates. This applies to the default paragraph style too! Like named rules, the default CSS rules are always statically connected to what they format (that is particular HTML tags). So, you can easily substitute them with your own default CSS rules. Every CSS rule produced during the generation of HTML output is registered (accounted) in a special table called style sheet, which is maintained by the HTML generator dynamically. That table will be printed eventually either as a part of some HTML file or in the form of a separate CSS file. This style sheet accounts all those CSS rules, which are commonly used across all generated HTML documents. The global style sheet is enabled when the option “Output | CSS | Generate style sheet file” is selected (true). When it is unselected (false), all CSS rules will be stored in local style sheets (according to where they are used). For instance, local style sheets may hold only anonymous rules, whereas global style sheet may be used for all default and named rules. Which CSS rules go where depends on the options controlling what's included in the global style sheet (i.e. CSS file). For instance, unselecting the option “Output | CSS | Generate style sheet file | Include anonymous rules” will cause all anonymous rules to be generated and stored locally by each HTML file where they are used. By default, the global style sheet (CSS file) holds all CSS rules. 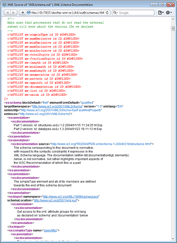 That makes the generated HTML documentation most compact. The ordering of these sections is important. Basically, it is because, in order to achieve the formatting effects specified in a template, several CSS rules may be applied together to the same HTML tag. At that, the properties specified in some of those rules must override the same properties specified in others. That can be achieved only by the specific ordering of the CSS rule definitions in the style sheet. See also: Appendix | Applying multiple CSS rules to the same HTML element. In particular, the definitions of anonymous rules must appear strictly after the definitions of named rules. Because, when both named and anonymous rules are applied together, the CSS properties specified in the anonymous rule must override those specified in the named one. This works only when the anonymous rule appears in the style sheet later. See also: Named + anonymous rules. Here again, the CSS rules specified in a lower group in that list must have higher priority. See also: Named + named + anonymous rules. Most of the said above actually has a single purpose: to allow the users to style the generated HTML documentation with their own CSS properties/rules. But please note, this is not the only (and even not the main) way how you can customize the generated HTML! Since all ready-to-use documentation generators (available on this website) are implemented in the form of templates, you can always change everything (both how your documentation looks and what it contains) by editing/modifying the templates. You don't want (have no time) to learn much about how templates work. You need a more quick (customary) way to modify the documentation formatting (rather than editing templates). You want to use some CSS features not supported directly in templates. Since it is impossible to tell the HTML generator which CSS rules must be used at which output locations, the only way to apply custom CSS rules is to substitute with them those produced automatically by the generator itself. That can be done only for the rules with a constant (predictable) connection to the specific output structures, which they are applied to. That is, whenever a given template set is used, the same pieces/structures of the output will be formatted with the CSS rules associated with the same tag/class selectors. This applies only to named and default rules! The anonymous rules, which have no predictable relationship with the output, must be preserved in any case to keep the overall formatting integrity. Another complication is that in the style sheet named rules must be defined in a specific order, so that properties specified in one rules override properties specified in others (in case of collisions), and anonymous rules must be defined the last, because their properties must override anything else. See also: Style Sheet Structure. All that means that replacing the automatically generated style sheet file with the static custom one may be rather tricky. Much easier is to let the generator produce the result CSS file by itself, at that, feed to it those custom rules that must substitute the generated ones. Lastly, if something extra is needed not coming from the generator at all, that can be added to the result CSS file via CSS pattern file. Here is the step-by-step instruction. Make sure that “Output | CSS | Generate style sheet file” option is selected. That will direct all CSS rules into a single CSS file. Output | CSS | Generate name rules = "all"
* Generated from style: "Derivation Tree Heading"
* Generated from style: "XML Source"
* The default font for the reproduced XML source. * Generated from style: "XML Source Attribute Name"
* The font for the names of attributes in the reproduced XML source. * Generated from style: "XML Source Attribute Name (Reserved)"
* The font for reserved attribute names in the reproduced XML source. 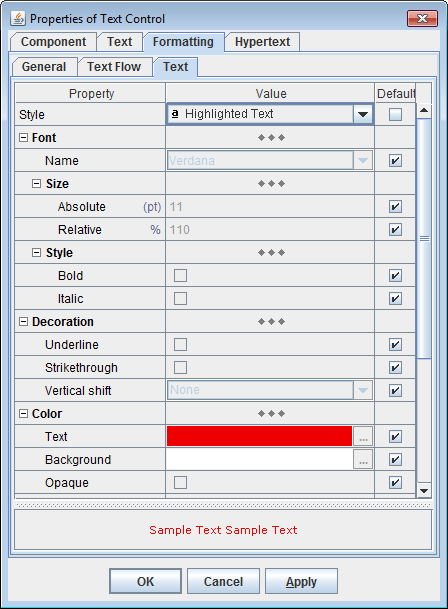 * Generated from style: "XML Source Attribute Value"
* The font for the values of attributes in the reproduced XML source. * Generated from style: "XML Source Attribute Value (Reserved)"
* The font for the values of reserved attributes in the reproduced XML source. * Generated from style: "XML Source Comment"
* Generated from style: "XML Source Comment Markup"
* Generated from style: "XML Source DOCTYPE"
* Generated from style: "XML Source Element Name"
* The font for the names of elements in the reproduced XML source. * Generated from style: "XML Source Element Value"
* The font for the values of elements in the reproduced XML source. * Generated from style: "XML Source Internal Subset"
* Generated from style: "XML Source Markup"
* Generated from style: "XML Source Processing Instruction"
* The font for Processing Instructions in the reproduced XML source. * Generated from style: "Hyperlink (blended in)"
* Used to format hyperlinks blended into the text. * Generated from style: "Hyperlink (blended in, hover)"
* Used to format completely blended-in (latent) hyperlinks. 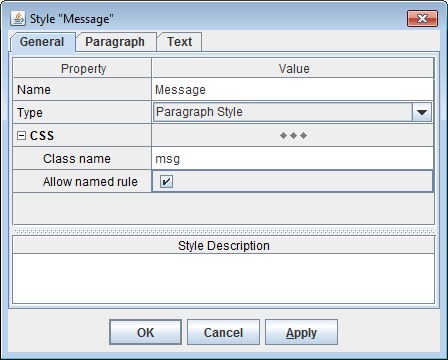 Now, you will be able to find those named rules, by substituting which you could achieve the result formatting you need. When you know which automatically generated named rules must be substituted, you can prepare your own declarations for them in a separate file. If you specify any of them in your custom rule file, your definitions will be picked and inserted in the generated style sheet. That will happen in any case, whether or not the generator was to produce a given default rule of its own. If you need to apply any other default CSS rules, you can do it via CSS pattern file. Although, these relative units are context-dependent (that is, CSS computes property values specified in such units against the context font size inherited by the element where the property applied), that is incompatible with the most concepts, on which FlexDoc (template language) is based. Because of this, FlexDoc treats all CSS property values specified in relative units effectively against the document base font size. That requires periodic resetting of the context font size to the document base font size. For more details, please see: Appendix | The problem with relative length units. Another consequence is that the same CSS rule cannot specify both the font size and any other relative-unit properties. When it is actually needed (in the case of a named CSS rule produced from a paragraph style), such a CSS rule will be broken into two ones applied to nested HTML tags (one for paragraph and one for text). For more details, please see: Multiple named rules with the same class selector | Property conflicts caused by relative units. Because of the said above, make sure that when your custom CSS rule contains some length-unit properties, the generated CSS rule it substitutes also contained that kind of properties. (Note that this is specified in the corresponding template formatting style, from which the given rule was generated). For instance, you should avoid substituting a CSS rule without font size with the one that specifies the font size. That may result in unpredictable distortions of the entire document formatting! If all this sounds too complicated for you, simply don't use relative units. 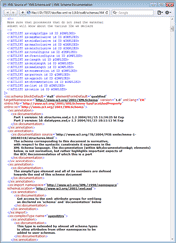 In case of FlexDoc/XML product line, it is the “FlexDoc/XML SDK” license. In case of FlexDoc/Javadoc product line, it is the “FlexDoc/Javadoc” license. This is considered a deep customization of your generated documentation (i.e. of the doc-generator implemented by a FlexDoc template set you want to use). Moreover, if you plan to customize the generated style sheets, you will likely need also to change something in the templates themselves as well as require some special support about all that. The CSS pattern file allows you to frame the CSS declarations generated by FlexDoc into your own CSS file. It may be useful when you need to add in the result style sheet some CSS rules not generated by FlexDoc at all (for instance, to format the HTML markup embedded in your descriptions/annotations). Those CSS rule that are generated can also be substituted with your own ones using custom rule file. Here, the dots depict some your content. All those lines will be copied as is to the result CSS file. The line '/* flexdoc-styles */' is important. All FlexDoc-generated CSS rules will be inserted in place of that comment. When it is absent, no automatically generated CSS rules will appear in the result CSS file. This opens a possibility to use the CSS pattern file as a complete your CSS file. You just need to provide your definitions for all generated default and named CSS rules and exclude from the global style sheet all anonymous rules by unselecting the option: Output | CSS | Generate style sheet file | Include anonymous rules. See also: Style Sheet Structure. The CSS pattern file can be applied only for the global style sheet. The local style sheets are not affected by it. The name of the result CSS file (generated by FlexDoc) will be the same as the name of your CSS pattern file. Thereby you can assign your own name to the result CSS file found in the generated documentation. According to CSS, relative units like % and em are interpreted actually not against some base font size chosen for the whole HTML document, but against the context font size inherited from the parent HTML element at the location where the property applied. This creates a problem. When a CSS rule with the specified font size is applied to an HTML element, any values in relative units used within that element will be interpreted against that font size. This would make many of the generated CSS rules context-dependent, which breaks the whole idea of named rules (which are supposed to be independent of where they are used). The medium keyword specifies the document base font size. In a few cases, it is impossible to insert an intermediate tag with the font size resetting CSS rule. So, if some length-unit values are applied down there, they must be adjusted to the context font size. The item numbers must be of a certain font size. The list items must have a certain spacing between them. The content of each list item may be complex with own font sizes, spacings etc. However, those resettings and adjustments, besides slightly bloating the output, make it rather unstable when you want to use custom CSS rules. There is a new relative unit planned in CSS: the rem (for "root em"), which will be computed exactly against the document's base font size. That would save us the day! Unfortunately, that unit is not quite established yet and not supported by some browsers. CSS does not allow you to base one CSS rule on others. What is possible instead is to assign several CSS rules to the same HTML element (just by listing their class selectors in the value of class attribute), thereby creating an inline rule based on all the listed ones together. The question is: When a CSS property is defined in several of those listed rules and has different values there, which of them will take effect? One could expect, it must be from the rule, whose class is listed the last. But that's wrong. Rather, that will be from the rule, which is defined the last! what color will be of the text? It will be blue! the color of the text will still be blue.